The track map dashboards contain a lot of information and are very customizable. It is suggested that you take the time to read this entire page to get the most out of the track map dashboards. Watch the YouTube video on Track Maps. The Z1 Dashboard software offers several special dashboards. These include the track map dashboards (discussed here), the telemetry dashboards and the timing and scoring dashboard Each of these dashboards provides detailed information that can be used to augment or replace the information included in the car's main dashboard. 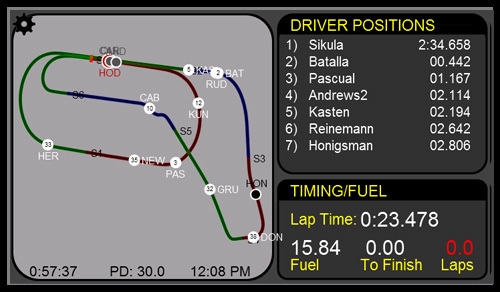 Track Map 1: this displays the Driver Positions information. Track Map 2: this displays the Car Data information. Track Map 3: this displays information about the car ahead of you in position and the car behind you in position and whether or not you are gaining or losing time to them. Track Map 4: displays the track map with no other data. 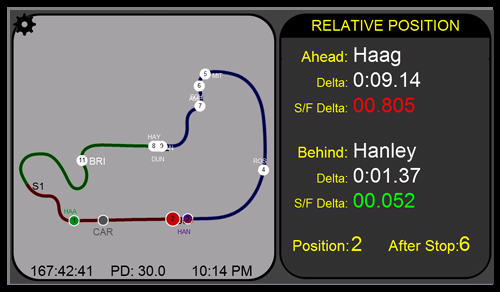 Track Map 5: displays timing and scoring information along with the track map. 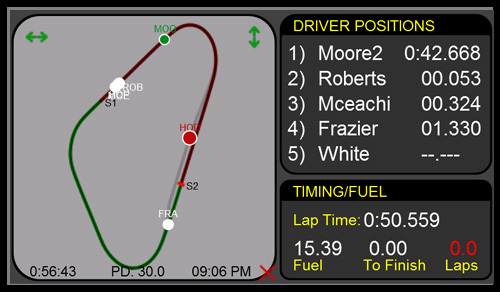 Track Map 6: displays wind and weather information along with lap time and fuel data. Track Map 7: displays wind and weather information along with gear and RPM, lap time and fuel data. 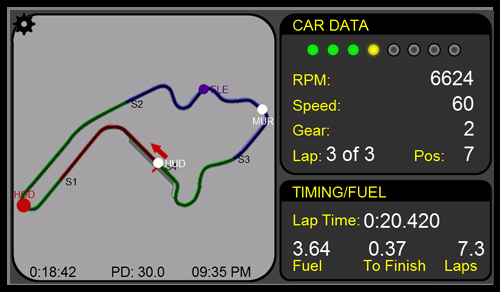 Track Map 8: displays lap time data along with lap, position and fuel data. 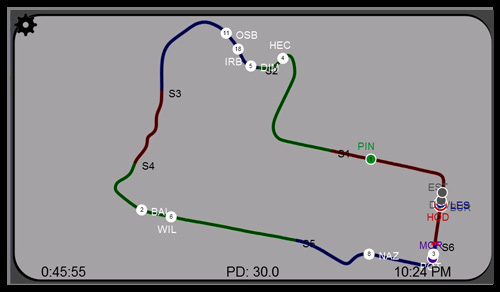 Track Map 9: displays car and pit stop information on the driver ahead of behind you on track. Track Map 10: displays timing information on the car ahead and behind you on the track. Track Map 11: displays RPM, gear, water temperature, speed nad lap information, along with a lap timer and delta timer. The Track Map 1 dashboard is included by default in the rotation of dashboards for the first instance. It is also the primary dashboard for the second instance. You may alter these settings as described in the Car Settings page to include both Track Map dashboards in the rotation if you prefer. However you choose to display this dashboard, the information is the same and is described below. Note that even though the track map dashboard can be used with all sims, not all the sims supply all the data required to support all of its functions. It is supported by iRacing, rFactor 1 & 2, ARCA Sim Racing and Game Stock Car, Kart Racing Pro, Assetto Corsa, Project CARS and the Codemasters F1 series. At this time the SimBin titles do not output the data required to show the car positions on the track. The track map is displayed in the main window on the left side of the dashboard. It includes the location of all cars either on track or in the pits. If a car is in the garage then it will not be displayed on the track map. 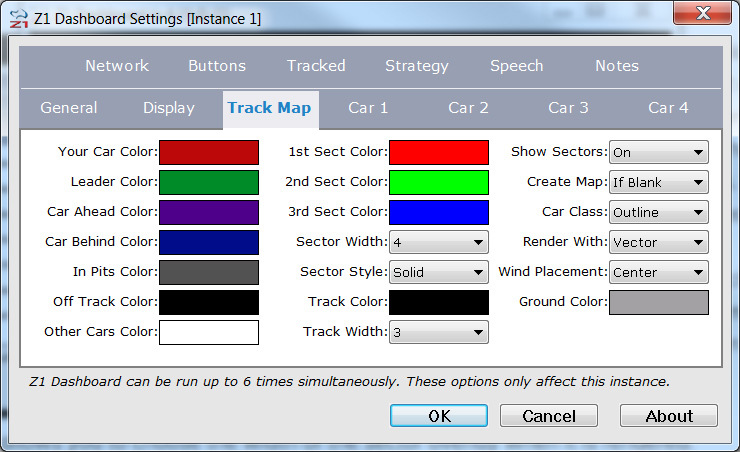 By default the track surface is displayed in black with an optional overlay of each sector. You can change these colors and options in the settings dialog. 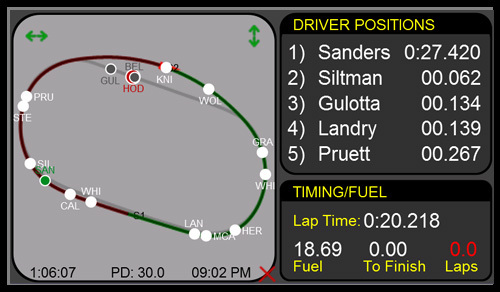 Each circle representing the drivers includes the first three letters of the driver's last name and is color coded based on one of seven options: Your Car; Car Ahead Of You; Car Behind You; In The Pits; Off Track; The Leader's Car; All Others. Note that the 'Car Ahead/Behind You' may not be the car right in front or behind you on track as there could be lapped cars between you. Each circle is outlined in a color associated with the car's class. This is very useful in multi-class racing. All cars in the same class will share the same outline color, making it easy to pick out the other cars you are racing against. By default the track map is automatically created if one does not exist for the track. Simply drive a few laps and you'll see it appear. If it appears flipped either horizontally or vertically then you can fix this by clicking on the green left/right or up/down arrows located at the top left and right of the track map image. There is also a red X button at the lower right of the track map. Pressing this button will delete the track map, replacing it with the default square. This can be used if the track map is created incorrectly for any reason. In addition to the displaying the locations of other cars on track an optional small square can be displayed with the associated text of "After Stop". This is displayed when you are low on fuel in preparation for your pit stop. The square represents where you will be on track after your pit stop. This can be useful to determine if you will exit your pit stop in clean air or if you will exit the pits ahead or behind another driver. Over time the software will calculate the average length of time a pit stop takes for you with each car/track/sim combination. 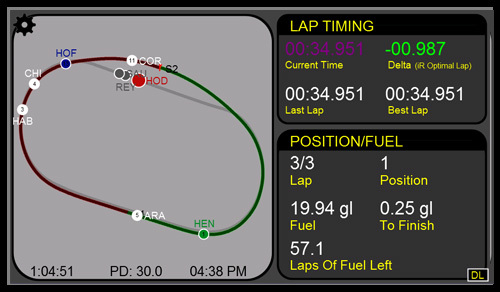 This timing data will be used to determine where you will rejoin after your pit stop. If a time cannot be determined then a default time of 30 seconds will be used. Alternatively you can set a fixed time by choosing the desired pit stop length in the settings dialog. This section, included in Track Map 1, displays up to five drivers. Your name will appear highlighted in the color specified by the Your Car color in the Settings Dialog. During a practice session the timing information will be the time difference between the displayed driver's fastest lap and the fastest lap of the session. During a race the timing information will be the time difference to the cars ahead and behind you. This section, included in Track Map 2, displays the car's current RPMs, speed and gear. In addition eight shift lights are displayed. You can adjust the color and RPM value for each of these lights in the settings dialog. Finally, the current lap and position data is displayed. This section displays your current lap time, the amount of fuel remaining in your car, the fuel needed to finish the race (or the lap in a practice session), and the number of laps to go before you will run out of fuel. The Track Map tab of the Settings Dialog is where you can customize the appearance of the track map. The first column of text fields allows you to specify the color coding for your car, the leader's car, the car ahead of you, the car behind you, cars in the pits, cars who have driven off track, and cars that don't fall into any of the previous categories. Clicking on the swatch will display a color chooser which allows you to select the desired color. The second column allows you to specify the colors used to highlight the sectors of the race track. If the track contains more than 3 sectors, then the software will cycle through the different colors when displaying each sector. The Sector Width drop down allows you to choose the width of the sector overlay when it is rendered. The Sector Style drop down allows you to choose how the sector overlay is rendered. Solid is a single solid line. Dotted renders the overlay as a series of individual dots. In this case the sector width option is the radius of the dots. Dashed renders the overlay as a dashed line. The track color field shows the color the automatic track map creation process will use when drawing the track. Clicking on the swatch will display a color chooser which allows you to select the desired color. The track width drop down tells the automatic track map creation process how wide the track should be when drawn. Show Sectors allows you to specify whether or not the sectors should be highlighted. The options are On, where the sectors will always be highlighted; Off, where they will never be highlighted; and Practice, where they will only be highlighted in practice sessions. The Create Map drop down tells the software when to create the track map. If Blank will create the track map if one does not already exist when you get to the track. Always will create the track map regardless of whether or not one already exists. Never will not create the track map even if one does not exist. The Render With option allows you to specify how the track map is drawn. Setting it to Vector will draw the map from data points recorded when driving. Setting it to Graphic will use a pre-created graphic for the track map. The Vector option will give cleaner images at higher resolutions. The Graphic option is the original way the maps were drawn, with the advantage of letting you mark up the track map if desired. When possible the Z1 Dashboard will display the wind direction as an arrow and the wind speed on the track map. You can set the location of that display by selecting one of the options here. The default option is to place the information in the center of the map. This is the color to be used when rendering the ground on a 3D track map. The actual displays of the track maps are PNG images. The Z1 Dashboard software will automatically create the track map for any track you drive on after a lap or two. You can specify when the track map is created. The options are "Always", "If Blank" and "Never". The "Always" option will create a new track map every time you run a new fast lap in a session. The "If Blank" option will create a new track map after every fast lap of a session only if there was not an existing track map at the start of the session. The "Never" option will never create a track map. Note that track maps are only created during practice sessions and not during a race. In addition to creating track map images for new tracks, you may also want to modify existing PNG images used to display the track maps. You can do this using any image editing software, from Paint to Photoshop. As an example, if you wanted to add notes to a track map, or corner names or numbers, you would edit the image appropriately and resave it. Now when you display the track map dashboard for that track, your edited track map image would be displayed.